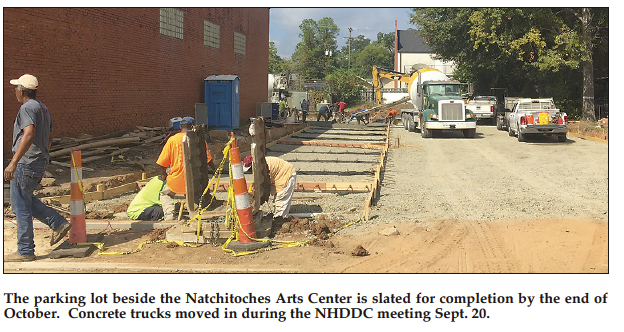 The shortfall in funding the Natchitoches Historic District Development Commission (NHDDC) expected has come to pass. The state granted the commission $319,165 which is 11 percent below their maximum funding of $360,000. Commission member Van Erickson said, “We prepped for this,” when they set their budget at $306,000. The NHDDC got four responses to their RFP for a branding and marketing strategy. Two companies will vie for the final go ahead, with both possibly getting a slice of the pie. One was stronger in web development while the other had a greater focus on branding. The executive committee will look at both proposals and determine which, if not both companies, would be best suited for the job. The proposals came in around $17,500 for the whole concept. Commission members said they would negotiate to the strengths of each. The brand and logo is phase one and should be available for launch in time for the Christmas festival. The remainder of the strategy will be completed next year. Erickson advised those present the investiture of Dr. Chris Maggio as NSU President garnered $1.5 million in earned media. “NSU has the highest enrollment and the largest number of donations in a while,” he said. Upcoming and recent events included a visit by ESPN correspondent Tom Renaldi, the Red Bandana on Sept. 27, a home football game Sept. 30 and Homecoming Oct. 20. Sandra Dickens spoke on behalf of the Historic District Business Association. She said over 200 cars were already registered for the car show with more expressing interest. It will be a busy week with a fish fry Thursday. Tickets are $20. The fair will also be underway and Dickens advised Fairgrounds Road will be one way, from Rapides to the bypass. There will be additional road closures along Touline and Church Street due to the car show. Other notable events include the American Cemetery Tour Oct. 7, Fall Tour of Homes Oct. 13-15; Heritage Area Open House at Grand Ecore Oct. 12 from 5-7 p.m.; a Pumpkin Glow at City Park Oct. 26 at 5 p.m.; and Archaeology Day at Grand Ecore Oct. 28 from 11 a.m.-4 p.m. The scientist who located the ancient canoe in north La. will be guest speaker for that event. Wings Over Natchitoches will be Oct. 13-14.There will be a twilight show Oct. 13 and day-long activities Oct. 14. Shuttles will be available as well as on site parking. Parish President Rick Nowlin advised the tax rate remains flat in the parish. “E-Commerce is hurting us. Mom and pop stores are just getting slammed,” he said. He said only Amazon and Wal-Mart are paying sales tax on online purchases. Edd Lee provided an update on the Riverbank development. “It is on schedule,” he said. “with the possible exception of the bathrooms.” The stage will get shingles and the amphitheater will get sod this week. The sprinkler systems are roughed in and stairs will be topped off with rail work and nosings. “We made a conscious effort to move crews to the top to get those areas ready for the car show,” Lee said. He also said restrooms were approved for City Park. City labor will be utilized whenever possible. “We also ordered a swing set for City Park. We saw how much the kids love to swing,” he said. The parking lot beside the Arts Center on Second Street will be complete by the end of October. Concrete trucks arrived while the NHDDC meeting was underway.